Breaking the windows of the Kildare Street Club | Come Here To Me! There is an enduring legend that during one game of cricket in Trinity College, a stray ball broke a window of the exclusive Kildare Street Club at the corner of Kildare Street and Nassau Street. 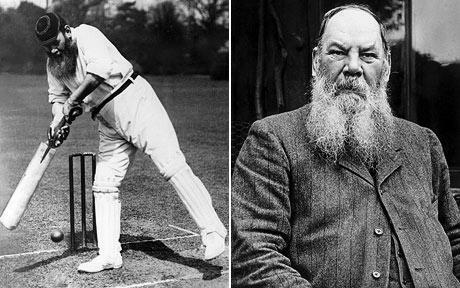 The story is usually associated with the legendary British Cricket player W.G. Grace who did visit Dublin a number of times in the late 19th century. 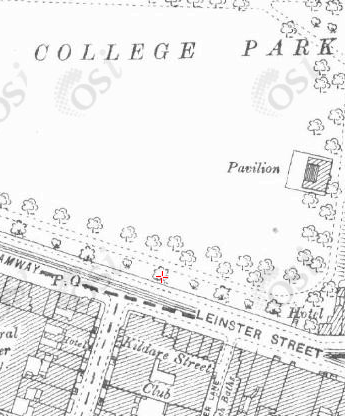 In 1897, witnesses are on the record saying hit a ball from College Park in Trinity over the fence and onto Nassau Street. Since then however, the story has grown legs and numerous individuals have been credited with his achievement. Heavenly weather really. If life was always like that. Cricket weather. Sit around under sunshades. Over after over. Out. They can’t play it here. Duck for six wickets. Still Captain Buller broke a window in the Kildare street club with a slog to square leg. An online Joyce website has done extensive research on trying to find out who this Bulller referenced could have been. A window of the Kildare Street Club was broken by a bat but (so far as I know) not by a cricket ball from College Park. In May 1922, I was in Kildare St. when some Army footballers returning from a playing pitch to Oriel House (Westland Row) kicked their ball football in the street. One kick resulted in the smashing of a Kildare St. Club window. The ball was kicked by Capt. Charlie McCable and I think that later McCabe defrayed the glazing expenses. An Irish Times writer, on a bus home, was retold the Grace story by a friend. 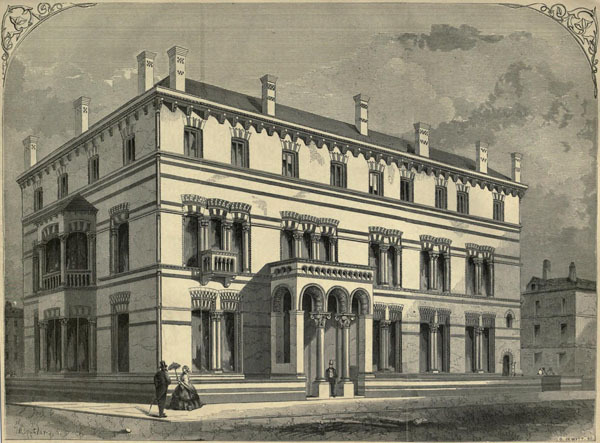 “We are now passing the Kildare Street Club. Nearly a century ago, W.G. Grace broke a window in it with a slog to square leg”. My correction was instantaneous and stern. “It was not W.G. Grace. The man’s name was Tyndall, he was an Irishman, and it didn’t happen nearly a century ago”. In the 1956 book Cricket in Ireland William Patrick Hone quotes Captain Fowler, the oldest cricketer member of the Kildare Street Club, as saying that the only window he ever heard of being broken “was when a sniper had a shot at Lord Fermoy and missed”. Scotland were meeting Dublin University … in College Park, and finding themselves a man short, invited “RH”, who was then a student at Edinburgh Veterinary College, to play for them. He accepted, and during his inning he hit two balls into Nassau Street, one of which smashed a window in a cab parked on the roadway, while the other rebounded from the wall of the Kildare street Club. The ‘cabby’ was amply recompensed for the broken window and the balls in question were retrieved in the ordinary way. But while a football and a snipers shot did break windows of the Kildare Street Club, it would seem that that the Cricket ball story is indeed just legend. Great to find further evidence of illegality and rough play from Oriel House!